Have you heard of Madelynn's Twinkling Tuesday Sketch Challenge? It's super cute, Jessica from The Whimisical Butterfly has an 8 year old daughter who gives us a hand drawn sketch every week to play with. Isn't that the sweetest thing you ever heard? She even made a card this week, check Jessica's blog to see it. This is sooooo cute! Love the bunny and the sweet little heart ribbon!! Oh this is so cute! What an adorable image! 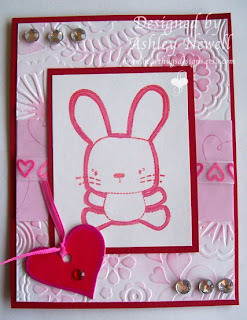 Ashley that Bunny is super cute and it goes so well with Valentines Day colors!! !